Figure 8. Alterations in seed cell wall structure affect seed dormancy and germination characteristics in Arabidopsis. A, Immunofluorescence micrographs of cell wall mutants showing alterations in cell wall architecture. xxt1 xxt2 seed cell walls contain no detectable LM25 XG epitope. 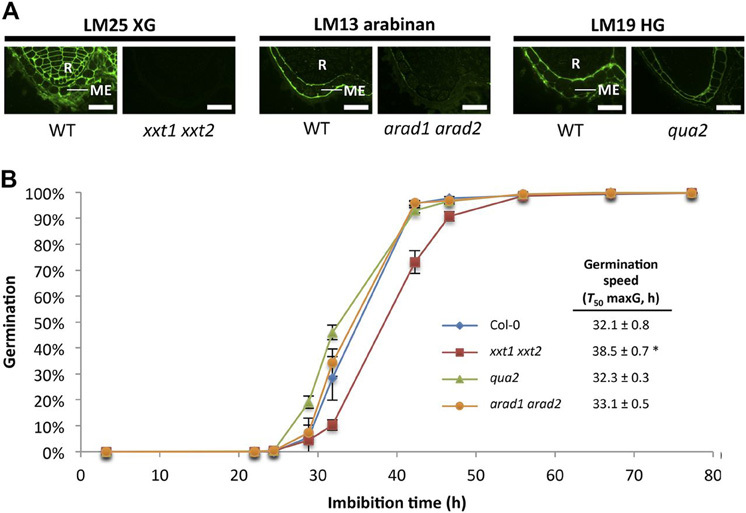 arad1 arad2 endosperm cell walls contain reduced levels of LM13 arabinan epitope. qua2 seeds contain less LM19 HG epitope. R, Radicle. Bars = 50 mm. B, Seed germination kinetics were assessed for after-ripened wild-type and mutant seeds. qua2 and arad1 arad2 germination speeds were similar to wild-type seeds. xxt1 xxt2 germinates significantly more slowly than the wild type. Means of germination speeds shown in tabular form.